❤Essential For Complete Eye Makeup:These essential eye brushes are ideally for liquids, powders, or creams to produce a beautiful eye makeup application. 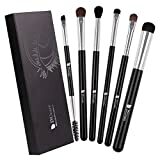 The set includes eyeshadow brushes, blending brushes, large eyebrow brush, duo eyebrow spoolie and concealer brushes. Different shapes and sizes of the bristles allow you to create a variety of eye makeup for daily makeup. Do not drop or absorb any pigment. ❤Grab your essential eye brushes to create the perfect smokey eye look or any eye makeup application. Look beautiful and live beautiful every single day by upgrading your makeup to the next level.SOFT AND WEIGHT APPROPRIAT: All brushes are extremely soft and easy to hold makeup, perfect for makeup lady and individuals with normal to sensitive skin and will not irritate you. ❤A Great Gift For Christmas! Birthday, Halloween, Thanksgiving Day :All eye brushes were assembled by hand and extensively tested. We hand-picked the most essential eye makeup brushes to serve a distinct makeup purpose to make sure you have all brushes needed to create a PERFECT EYE MAKEUP. These soft makeup brushes are easy to clean and they dry off fast. ❤100% SATISFACTION GUARANTEE:Bellexixi Offer 100% GUARANTEE: 100% Money Back Guarantee if you are not satisfied.We will offer Responsive and Friendly Costumer service. ❤PEREMIUM PROFESSIONAL EYESHADOW BRUSH:Each eyeshadow brush was assembled by hand and packed individually. Made of premium synthetic fiber and soft animal bristles materials provide an incredible touch and feel,will show your natural beauty and leave a perfect finish.Soft Synthetic Pony Bristles & High Quality Wooden Handles: No shedding, with the high-tech bristles which are well made of soft synthetic&pony fibers and durable handles, feel amazing on your skin by using these eye makeup brushes.